I have to admit I had a difficult time trying to name this recipe. 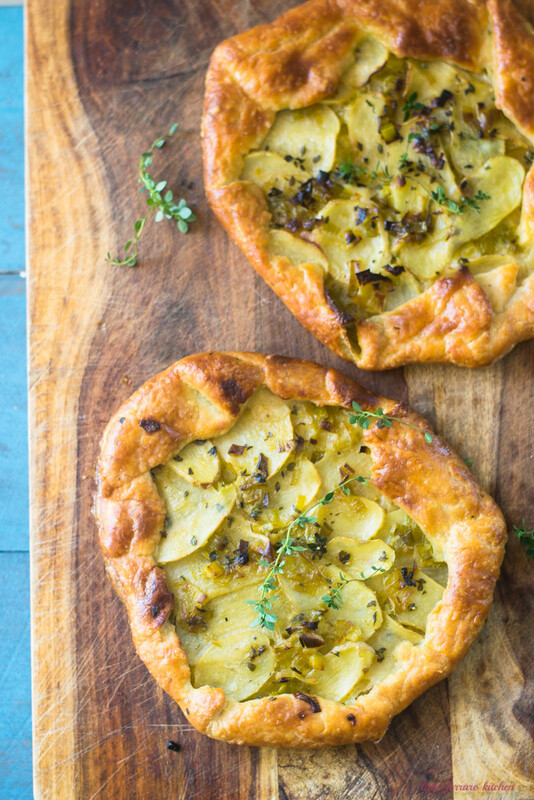 Do I keep it to the point and call it “potato and leek tart” or do I make it fancy and use hard to pronounce words to make my readers think I know that I’m talking about. Well obviously, you know the answer. Plus, it sounds awesome. Vichysoisse galette. I imagine myself enunciating each syllable in my made up French accent. Drinking a glass of Rosé and wishing I was in Epernay for just one more moment. But alas, this gallete will have to suffice and bring me back to flavor memory with it’s simple, clean and direct flavors. Vichyssoise was one of the first Julia Child recipes I ever made. 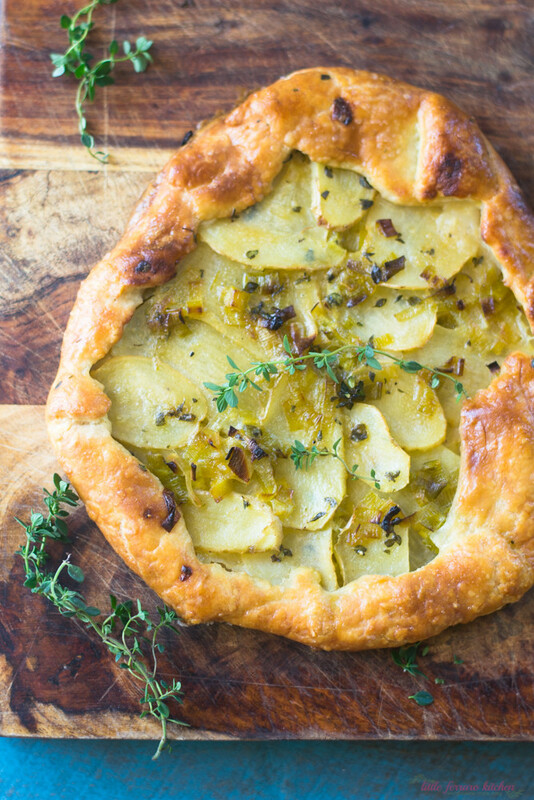 I fell in love with the simple flavors of earthy yet delicate leeks and simple potatoes. Turning those ingredients into a tart was a no brainer. The starchy potatoes are sliced incredibly thin to achieve texture and also not have to pre-boil them and the leeks would be sauteed in butter, because, we are dreaming of France, aren’t we? Oui! oui! To up the flavor notches just a bit more, I dressed this elegant vichyssoise galette in tangy Maille white wine Dijon as both a mustard vinaigrette and a mustard bechamel. 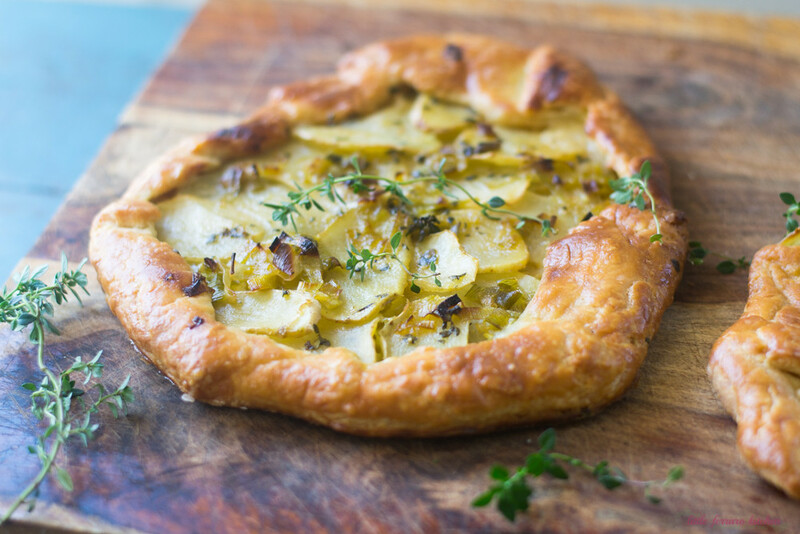 The mustard bechamel acts as the glue between the pastry and sliced potatoes and a quick Dijon vinaigrette lightly dresses the sliced potatoes before they are layered into the galette. As everything bakes together, the mustard intensifies just a bit making it the perfect accompaniment for leeks and potatoes. First make the dough, Sift together flour and salt in bowl and add to clean food processor with a dough attachment. Add small cubes of butter and blend together in food processor until it looks like small peas. 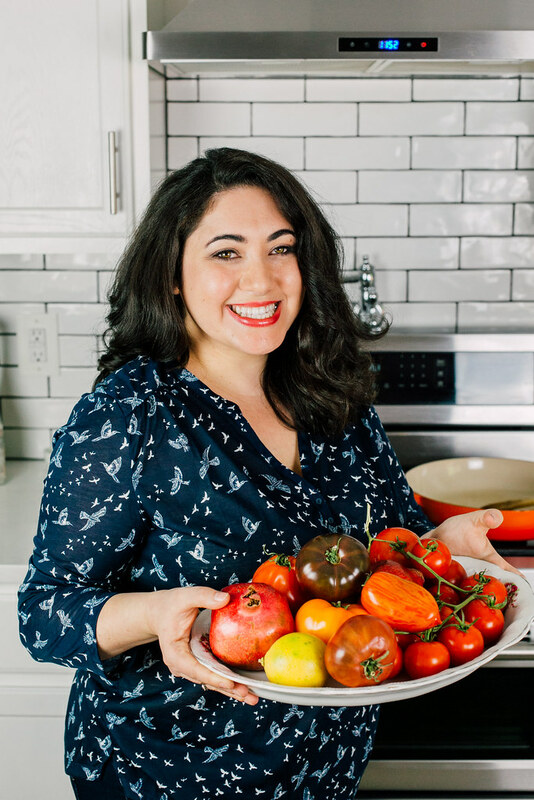 Next, make the vinaigrette. In a bowl, whisk together all the ingredients and taste for seasoning. Add sliced potatoes to the vinaigrette and toss gently to combine so all the potatoes are coated in the dressing. Set aside. To make the leeks, in a large skillet add the butter and leeks and cook leeks on medium heat until just about wilted. Season with salt and pepper. The leeks should still have their green color and not be overcooked. Set aside. Then make the bechamel. In a small pot, whisk together the butter and flour until there is no raw flour left. Add the mustard, paprika, salt and pepper and whisk to combine. Then slowly stir in the heated milk and continue stirring on low-medium heat until the milk thickens and mixture coats the back of a spoon, about 2-3 minutes. When ready, taste for seasoning and set aside. When dough is ready, roll out on a lightly floured surface to about 12 inches in diameter or make 2 smaller ones (like I did this time). Once dough is rolled out, transfer it to a non-stick baking sheet before filling. 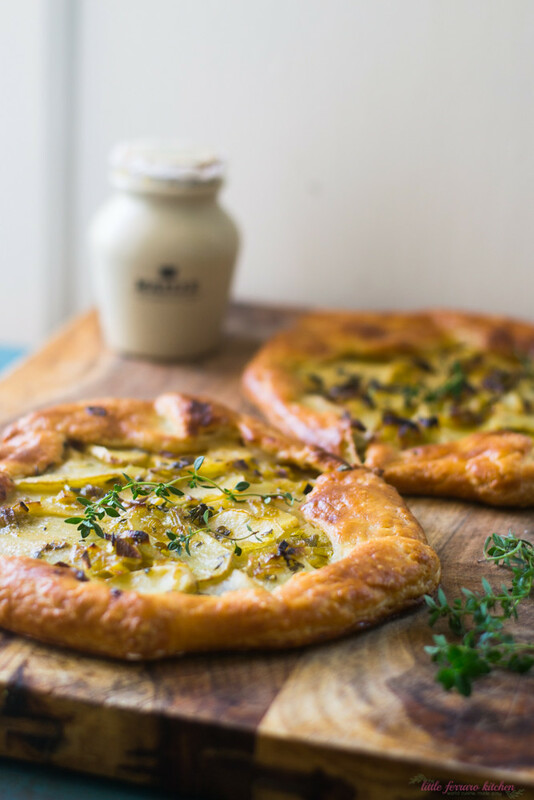 Spread mustard bechamel on dough leaving a 1 in border around, then layer with sauteed leeks and sliced potatoes. Fold the border over, creating a pattern if you wish. Brush egg wash around the crust and sprinkle with sea salt. Bake galette at 400 degrees F for 20 minutes until the crust is golden brown and potatoes cooked. Tip: After slicing potatoes, soak them in cold water while you're preparing the rest of the dish, which will help potatoes get more crispy. Then pat try with paper towels before dressing in vinaigrette. If you see the crust is getting dark to quickly, cover tart with foil and continue baking. Enter to Win a Trip To France! This looks fabulous! I can just imagine the flavor this has. I love savory tarts. Im going to have to try this one next time I need a carb overload. Haha Thank you so much for the comment Julie!! Yes, definitely make this AFTER the workout, perhaps?? What a beautiful recipe! I love the classic leak potato combo. It just tastes so…French!!! Beautifully done! And gorgeous pics! I soaked the potato in cold water for 18 hours and combined caramelized onions with the leeks and the results were truly Lyonnaise! What exactly is the vinaigrette for? I don’t see any further instructions for it after it is made. Thanks! Hi Nancy…its in step 4, says to toss the potatoes with the vinaigrette!